Friday kicks off the 2010 Dallas Quilt Celebration and the Dallas Area Fiber Artists have a wonderful exhibit showcasing the different works of our members. Today I helped with the setup of the exhibit and it is wonderful! 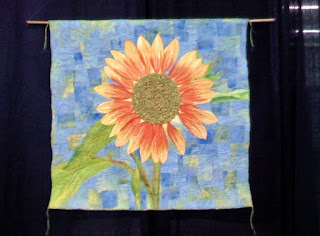 I had taken my "Sunflower with a Passion for Color" quilt with me to add some beads to it if I had time while we were waiting for our group to submit their artwork. You know how it is, you always have to take something to work on or a book to read, no matter where you go or what you do! Anyway, we ended up needing a couple of extra pieces, so I added some more beads and then hung it up! I'm so excited! The other pieces I have in the show are my Old Alton Bridge, Mexican Sunflower and Sunflower Shawl. These call all be seen on my website or my gallery that is linked to my blog. If you are in the Dallas area, it is worth the time to come to the show and see all the wonderful quilts and the DAFA exhibit!